At What Age Should Your Child Have His or Her First Dental Visit? The first dental visit is less about detecting cavities and more about education. Sure, the pediatric dentist will check for cavities, but the real goal of the appointment is to educate parents! Cavities: Cavities can form quickly on baby teeth because the protective outer coating (enamel) is thin. Most cavities in young children are linked to prolonged bottle or sippy cup use, frequent snacking, and/or improper brushing. 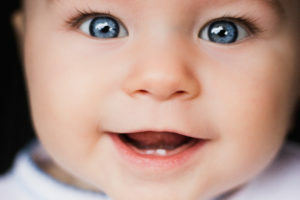 The pediatric dentist will evaluate your child’s diet and brushing routine to identify potential cavity-causing habits. Together, the dentist and parent will develop a diet and brushing routine to help lower the risk of a cavity. The dentist will also demonstrate various brushing techniques to make the job easier at home. Injuries: Uncoordinated toddlers are at high risk for injury. Common dental injuries include torn lip tissue and knocked-out teeth. The pediatric dentist will educate parents on how to handle these unexpected injuries. The dentist will also provide an emergency office number for any accidents that take place on the weekend or after hours. Development: Baby teeth erupt (grow) at specific ages following a specific sequence or pattern. The pediatric dentist will evaluate the current position of teeth and prepare parents for changes that will take place over the upcoming months. The dentist will also discuss safe ways to approach teething. Habits: Prolonged sucking on a pacifier, finger, or thumb can move baby teeth out of position. This movement may result in future orthodontic needs (braces). The pediatric dentist will discuss the importance of early pacifier use, along with ways to kick the habit in older children. 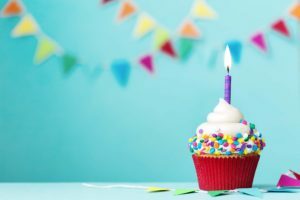 We encourage all parents to schedule their child’s first dental visit by their first birthday!